Situated between Rockland, Camden, Bar Harbor and Acadia National Park (3 hours north) and Portland, Boothbay Harbor, and L.L. Bean in Freeport (90 minutes south), Blue Tulip’s Tenants Harbor lodging is centrally located for tourists, shoppers, art or nature lovers exploring Mid-Coast Maine’s beautiful, rock-bound coast. The peninsula’s gently rolling hills are perfect for bike riding. Nearby harbors, inlets and rivers are popular with sailors and kayakers. Known fondly as “Wyeth Country,” the Rockland/Port Clyde/Tenants Harbor/Cushing area’s beautiful views, museums and galleries also attract photographers, painters and artists throughout the year. The Blue Tulip is within walking distance of Tenants Harbor’s general store, library, post office, restaurants, and the St. George Elementary School. 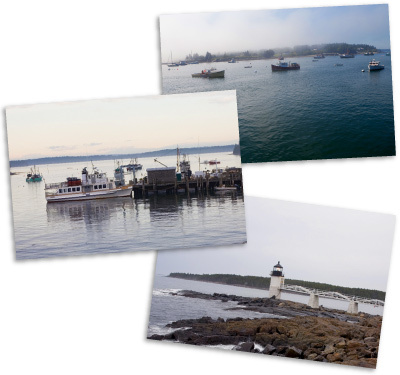 Port Clyde’s Drift In Beach, Marshall Point Lighthouse and Museum, Monhegan Island Ferry, general store, ice cream shop, art galleries, souvenir shops, boat ramps and kayak rentals are just 3 miles away. Mile-long hike on the rocky breakwater! Great views of Rockland Harbor! Schedule a guided tour or rent kayaks and stand-up paddleboards for a few hours. Two lovely walking trails, very close to Blue Tulip. You can pick up trail maps at the Town Office or Jackson Memorial Library. Maine’s leading non-profit institution dedicated to advancing contemporary art through exhibitions and educational programs. New $3.2 million facility opened in 2016. Year-round concerts, plays, recitals, conference presentations in a restored 19th century opera house. Check www.camdenoperahouse.com for calendar of events. Mid-Coast Maine’s only professional theater company offers full-length productions and readings throughout the year, sometimes in collaboration with the Farnsworth Art Museum. See www.everymanrep.org for schedules and tickets. The historic Rockport Opera House is the perfect venue for concerts, theatrical productions, readings, meetings, even weddings and family reunions. Contact www.rockportoperahouse.com for schedule and availability. The historic Strand Theatre offers first-run movies, concerts, readings and conference presentations throughout the year. See www.Rocklandstrand.com for schedule and tickets. Spotlights St. George Business Alliance member businesses, services, Job opportunities! Annual Memorial Day Weekend event honoring America’s veterans and active military personnel. St. George shops, restaurants celebrate the coming of summer–sales, discounts, yard sales! Pancake breakfast, parade, memorial service, patriotic music at the American Legion honoring St. George veterans. Seven Midcoast Maine lighthouses open free to the public. See all 7 in two days! Bands, floats, food, music topped off by evening fireworks! Parade of tall ships past Rockland Breakwater Light and Rockland Harbor. One of several venues on the national tour! Multiple stages featuring well-known musicians. Celebrates the peninsula’s heritage! Pancake breakfast, parade, lobster feast, craft fair, annual Jackson Memorial Library book sale & silent auction, fireworks. Open studios, art galleries, artists painting at several St. George locations. Sponsored by the St. George Business Alliance. Camden International Film Festival, Camden, Rockport, Rockland locations. Weekend screenings of new films at three Midcoast locations. Three-day celebration sponsored by the Maine Organic Farmers and Gardeners Association. Lighting of the lobster trap holiday tree, Santa arrives in Saturday night’s light parade! Sales, open houses, Oceanview Grange craft fair and fund-raising luncheons. Hundreds converge on Camden to hear diplomats, educators, journalists and industry leaders tackle topics such as American foreign policy, globalization, and the politics of food and water.